Tell Me a Picture is a fabulous way to introduce children to art and visual storytelling. 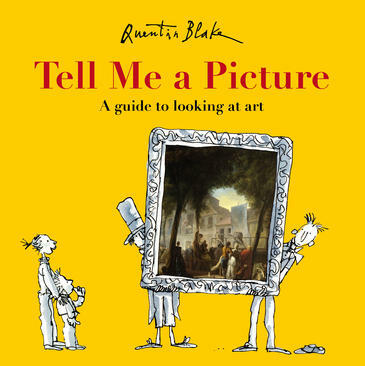 It was developed from a 2001 exhibition at the National Gallery in London, curated by artist and author Quentin Blake. The edition being reviewed is a reissue of the original book, with “a word of explanation” from Blake. The book features twenty-six different pieces of art by painters and illustrators. There is one for each letter of the alphabet, with the letters connected to the names of the artists. The first picture shared is “A is for Avercamp” and is accompanied on the opposite page by several Quentin Blake characters - children - making observations and asking questions about the artwork: “Can you see that man who has fallen over? I hope they don’t fall through that hole in the ice. It makes me feel chilly.” The generous use of white space around the characters helps to emphasise the art they’re viewing. This approach is repeated for each letter of the alphabet, just as though Blake is taking us on a tour of the art gallery, with the questions acting as prompts to encourage you to look deeper and consider the stories the artists are trying to tell. There is good range of art included in the book, created by both masters and modern artists, all of which Quentin Blake has selected and identified as ones he personally enjoys. You’ll find work by Adolphe Monticelli, Jack Yeats, Paolo Uccello, John Burningham and Gabrielle Vincent, amongst others. Notes at the end provide details of each painting - title, artist, size, a short contextual description of the piece, and brief biography of the artist. There is also a list of the different galleries and other places the pictures can be viewed in person. Simplicity is what makes Tell Me a Picture work brilliantly. It’s perfect for reading at home, or using in a classroom with all age groups. It should also turn a trip to a gallery into a new experience. I love Tell Me a Picture. A wonderful addition to a home library.